Read about IRS Form 8832 for entity classification. Includes step-by-step filing instructions and frequently asked questions. 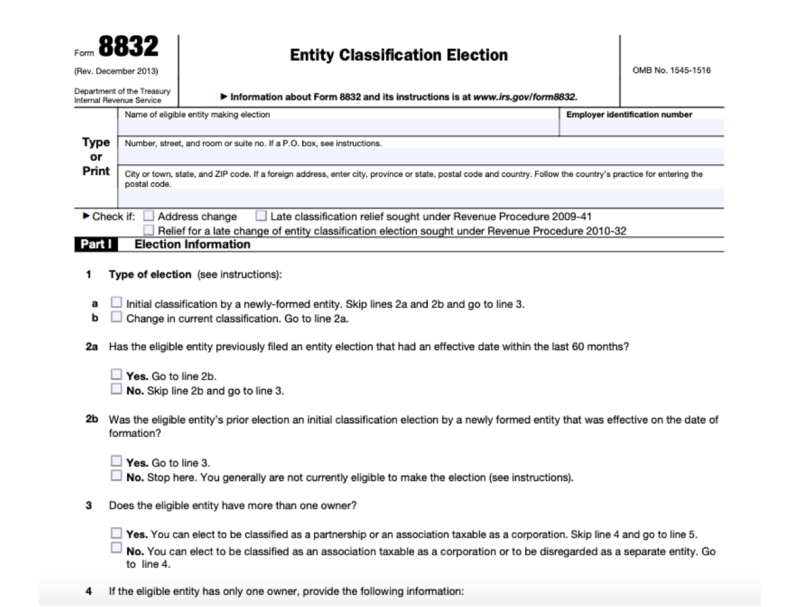 Form 8832 is the IRS entity classification election form that business owners can use to designate the classification of their business entity (Corporation, Partnership, etc.). This form can be used to notify the IRS that your business is changing from its default tax classification. Below you will find step-by-step instructions for filing Form 8832, as well as some frequently asked questions. Relief for a late change of entity. If none of these options are applicable, then do not check a box. Answer questions in Part 1 (Election information). Part 1 is in the form of a questionnaire that asks about the current classification of your business and your history in regards to filing for a new classification. In the section, the name(s) of the owner(s) and any parent corporation(s) must be identified. The name and contact information of a contact person must also be recorded in case the IRS needs to contact you regarding Form 8832. The consent section must be signed by an authorized officer or officers of the business. The signees must also add the date and their official title. These signatures represent your agreement that all of the information on the form accurately reflect the reality of your business entity. Explain and sign late election relief portion, if necessary. If you need the new status of your entity to be applicable to previous financial activity, you can apply for late relief. Late relief, when it is granted, allows you to classify your business entity differently for past taxable income. You may not be approved for late relief, but the form requires that you provide an explanation as to why you did not file as intended previously. The request for late relief must also be signed and dated. Form 8832 should be submitted with a copy of your company's federal tax return. Submitting these documents together will ensure that the IRS has all of the applicable information to either grant or deny your request to change your business' status. What is Form 8832 used for? Form8832 is used to notify the IRS of a change in the classification of your business entity. It is sometimes called Form 8832 Late Election Relief. Who can qualify for late relief? The IRS has a resource page explaining the rules for late election relief here: www.irs.gov/businesses/small-businesses-self-employed/late-election-relief. How long does it take to find out if my application on Form 8832 was accepted? The IRS will notify your business of acceptance or nonacceptance within 60 days of the form being filed. Carefully fill out the form according to the instructions for 8832 to make sure that there are no delays. Where can I find Form 8832? You can download a print-friendly version of form 8832 in PDF format from the IRS. Just go to irs.gov/pub/irs-pdf/f8832.pdf. Where are the official IRS form 8832 instructions? 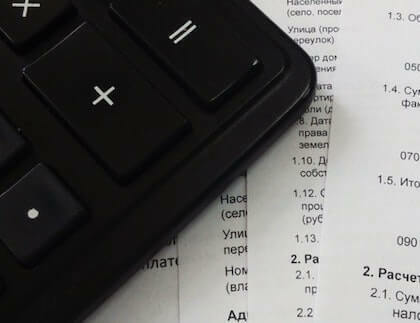 There are detailed form 8832 filing instructions on page 6 of the form. The official 8832 form instructions should clear up any confusion that you may have when filling out the form. The IRS 8832 instructions are very detailed, so they should address any questions that come up while you are completing the paperwork. How does Form 8832 late election work? If your application for late election is accepted and you qualify for late election relief 8832, your business can be reclassified and you can file your taxes as a different type of business entity. Enter your business contact information. Provide details about the type of business entity you are electing. Complete the questionnaire on the form. Explain why you are applying for late election relief. How to Fill Out IRS Form 1065?